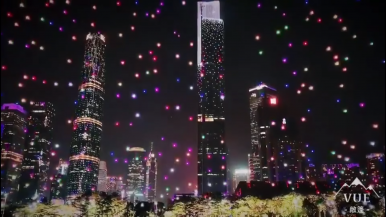 Illuminated drones maneuver in sync at the Global Fortune Forum in Guangzhou, Zhina. Having shown its mastery of the key to successful drone swarming, China has moved beyond the initial steps in the process. Programmed units have also proven their capacity for independent thought. During its swarming demonstrations, the miniature drones, when falling out of sync with the group or failing to achieve their intended objectives, would execute their own landing. If drones swarms can be used for overwhelming and confusing military or security defense systems, allowing conventional forces to almost freely enter into a particular environment, a conventional force will have achieved a major or even decisive tactical or operational advantage over an enemy even prior to engagement. The United States’ Low-Cost Unmanned aerial vehicle Swarming Technology (LOCUST) program, for instance, exhibits a system that rapidly discharges drones into the air from a single tube, like an anti-aircraft gun spewing hundreds of rounds in seconds. Given China’s success in replicating lower-tech versions of the U.S. Predator and Reaper, similar systems are equally attractive. If the words “quantity has a quality all of its own” have resonated with China, then China has clearly merged that concept with the value of high-tech and artificial intelligence (AI) to gain the most out of the concept of swarming. While the United States is still in the early stages of drone swarming, China’s demonstrations indicate that in some respects, it has surpassed the U.S. in this area. The attraction of mastering drone swarms resonates in both the defensive and offensive realms of warfare. They can be used as part of air defense measures in the event of an attack and a major war, being operated by another aircraft and released in mid-air by fighter jets. In an offensive scenario, smart swarms can drastically undermine and neutralize enemy defense systems, freezing defensive elements in a given battlefield and allowing for near-free movement and roaming of offensive forces. China’s mini smart drones are also reported to have self-repair capabilities. Fulfilling such a role is further indicative of a truly autonomous ability that can present countless benefits in the future. Network-based coordination and operation currently exists in the unarmed drones sector; however, the nature of flight patterns and movements is exemplary of an interest in military applications. A swarm of drones, for example, can operate as if they were conducting an attack on a particular target type, like a warship or a lone tank. Once perfected, the swarm and its flight patterns can then be fine-tuned to account for the existence of small payloads. Short of carrying a payload independent of the drone proper, a drone could essentially act as a missile itself. Though previous simulations involved roughly 100 drones, mastering formations of 1,000+ drones would radically change the outcome. Far from practicing drone swarms in the air, close to the ground, and over water, China looks to apply its swarming capabilities in near space (approximately 20 km above sea level). In 2017, Beijing successfully tested its spy drones in near space, for the purpose of gathering intelligence that can be used for military and security purposes. Mapping terrain and knowing the battlefield prior to an operation carries distinct advantages. Testing that took place in 2017 involving the Academy of Optoelectronics at the Chinese Academy of Sciences in Beijing resulted in the successful flight of drones launched by means of an electromagnetic pulse, which streamed toward their targets without human guidance. The drones, which reached speeds of 100 km/hr within the span of a meter, adjusted their trajectory and their altitudes along the way. Coupling the ability to master drone use with drone swarms as a way of gathering critical intelligence and essentially seeing anything down below is promising as it would also present cost-effective ways of doing what satellites do without the costs involved. The same operations can be conducted with instruments the size of a bird, therefore amplifying the flexibility of intelligence gathering competencies. The procurement of valuable intelligence regarding military presence of movement can have significant impacts on balances of power between states. Does Russian Military Aviation Have Anything Left to Offer China?Is China Fueling an East Asian Arms Race?Explaining the Proliferation of China’s DronesWhat’s Behind Indonesia’s China Drone Buy?Is the UAE Secretly Buying Chinese Killer Drones?